Scandal surrounds indigenous management of a major Easter Island protected area, a newly described freshwater crab species in Colombia, declines in Central America’s peccaries, and a man who can recognize more than 3,000 birdsongs were among the recent top stories from our Spanish-language service, Mongabay Latam. A Mongabay Latam investigation revealed nepotism and fraud in the financial administration of Rapa Nui National Park on Easter Island, the UNESCO World Heritage Site famous for its enormous stone statues known as moai. In less than two years, family members of the administrative council received more than $500,000 in payments, triggering an outbreak of violence. 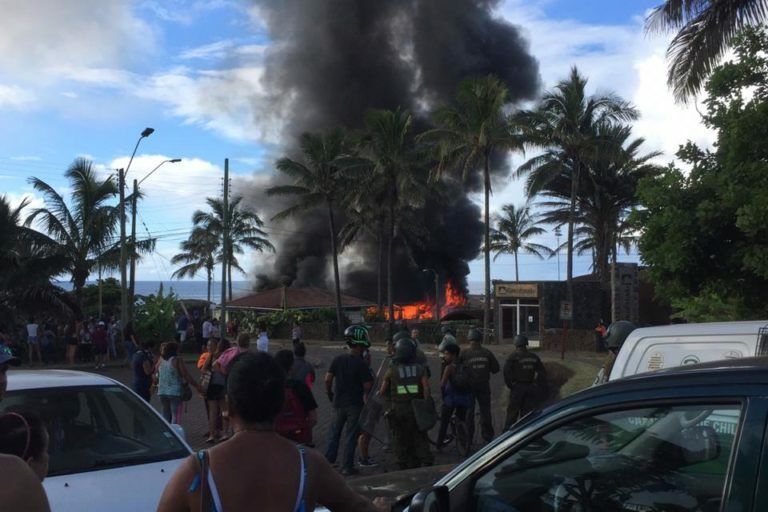 Fire at the court house, Easter Island. Image by Tamaru Huke. “No species represents the plight of the forests like the white-lipped peccary, which is now teetering at the edge of extinction due to habitat loss and hunting,” said Jeremy Radachowsky, Director of the Wildlife Conservation Society’s Mesoamerica and Caribbean program. A large herding animal that resembles a pig, (Tayassu pecari) now only ranges in 13% of its former habitat. Experts see its decline as a sign of the region’s deforestation. 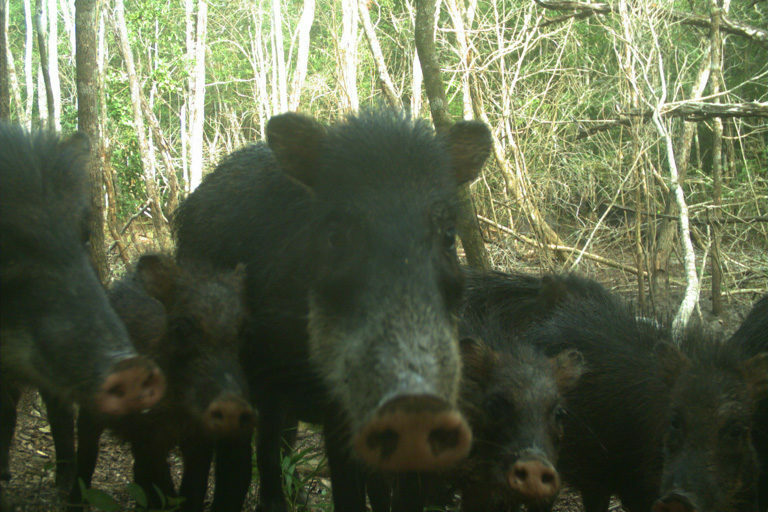 A camera trap captures the image of a group of white-lipped peccaries. Image courtesy of WCS. 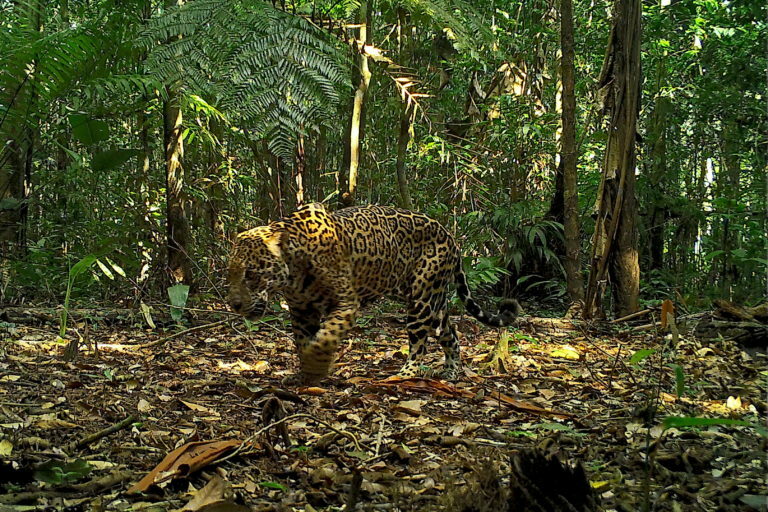 A citizen science project in Peru’s Tambopata National Reserve has identified 25 mammal species, including recent sightings of 20 jaguars. More than 100 camera traps monitor the 77-square mile (200 square km) park in the Madre de Dios region, one of the most extensive tropical forests in the world. The images are uploaded into the participatory platform Zooniverse for identification. Jaguar image captured by camera trap. Image courtesy of AmazonWired /San Diego Zoo Global. A newly described species of freshwater crab was recently registered in the Magdalena river basin in northwest Colombia. Identification of the bright orange crab (Phallangothelphusa tangerine) is a positive sign for the basin’s health, says Colombian biologist Maribel Arias, who first found it. 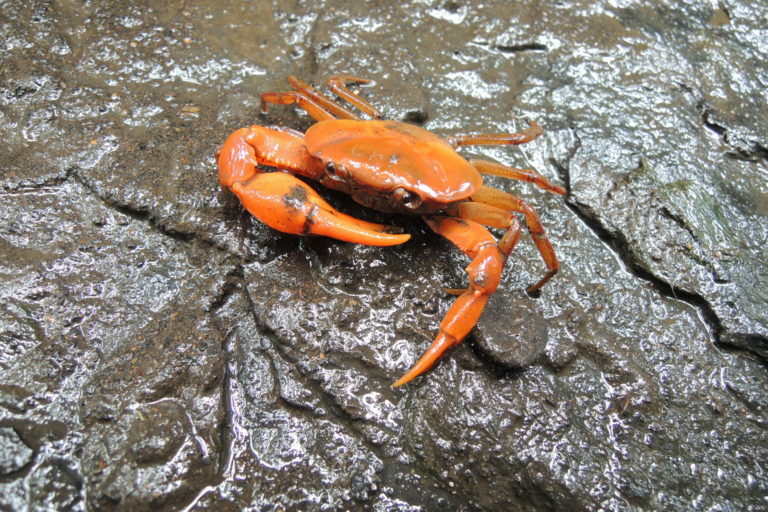 The bright orange crab was found in Santander province in western Colombia. Image courtesy of Maribel Arias. 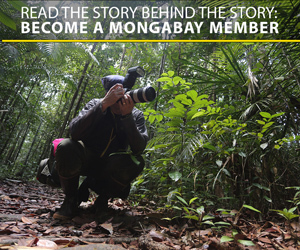 “Sounds tell you about the land’s transformation,” said Juan Pablo Culasso in an interview with Mongabay Latam. Born blind in Uruguay, Culasso can identify more than 3,000 songs of 700 bird species. In the 15 years he has been recording birdsong, he has worked on neotropical audio archives with Jacques Vielliard in Brazil, given seminars at the Cornell University Ornithology Lab, and currently collaborates with the Macaulay Library, the premiere scientific archive of natural history audio. 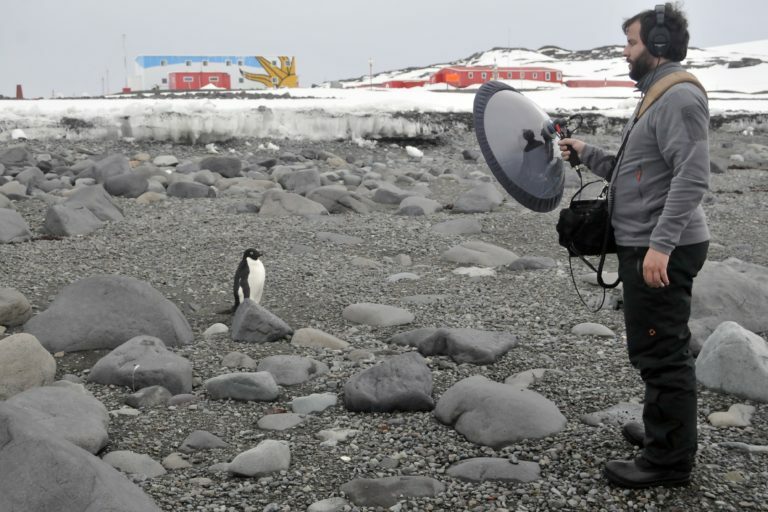 Recording penguins is one Culasso’s favorite memories. Image courtesy of Juan Pablo Culasso. “If they come back, we’ll take other measures,” promised Barbarita Meza, leader of a defense committee for Bolivia’s Tariquía Flora Fauna National Reserve in an interview with Mongabay. 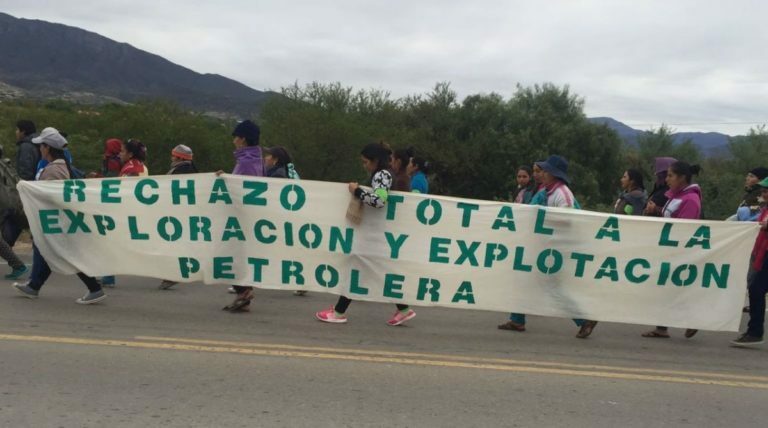 Last month residents in the reserve set up a road block to stop the entry of oil exploration teams. Last year three oil concessions were granted in the park, part of what opponents call an intense campaign of oil activity.